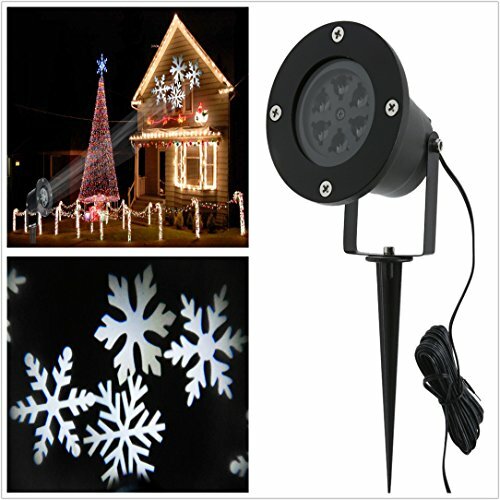 *【UPDATED】Super Bright 12W(4*3W LEDS),giving you the amazing Clear snowflake atmosphere. *【WATERPROOF】Waterproof Degree IP65, so you can use it even in Snowing or raining days. *【DISTANCE】It can Illuminate Long Distance clearly, from 15-20 Meters. *【Certificated】Compliance with the Safety Certificate,giving you a happy and safe experience. *【Applied】Suitable for Christmas decoration, garden/yard/house/wall and so on.